Genito Gomes, third from left, is one of a group of Kaiowa who filed a claim for land but, subsequently, have been driven off of it three times. Mr. Gomes says his father was murdered the final time, by men sent by local landowners. Munir Chami and Genito Gomes have a considerable amount in common. They're Brazilians who grew up in the countryside, straight-backed, clear-eyed men in their mid-30s. Each has a ready smile, hospitable nature and a quiet air of authority. Each is married with young children. They each work hard: They spend their days on their families' land, and they are immensely proud of their connection with it and what they have built there. In another country, Mr. Chami and Mr. Gomes might well be friends. Not here. That land they work, it's the same piece of land, and each man believes with utter conviction that he owns it – and that the other is an invader, a thief, who seeks to take both the land and the identity that comes with it. 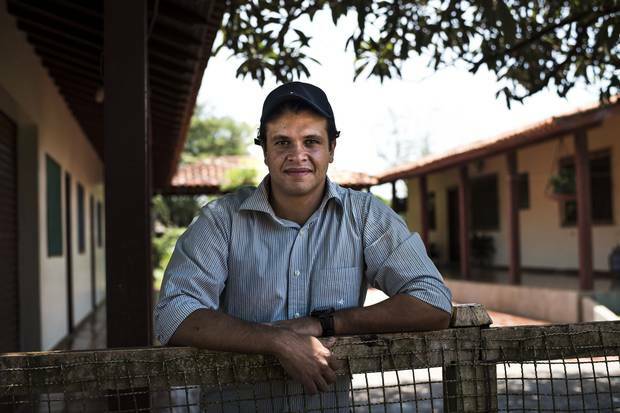 Munir Chami’s family bought their farm outside the town of Aral Moreira in 1970, before Brazil’s constitution formally granted Indigenous people land rights. Now, Mr. Chami’s business pays the equivalent of $17,000 a month on private security to protect the property. Mr. Chami is a soy grower whose family owns a 5,000-hectare industrial farm in the western breadbasket state of Mato Grosso do Sul. They live in a gracious farmhouse surrounded by tall trees, an island in an ocean of dark green fields, outside the town of Aral Moreira. And Mr. Gomes lives with his family across the road and a few kilometres away, in a settlement of a half-dozen dwellings built of sticks and thatch, at the edge of the last tiny patch of forest in any direction. This land, he says, has belonged to his people, the Kaiowa, since there were first humans on Earth; his people were created from this red soil, and Brazil's constitution has recognized their right to it since 1988. Mr. Gomes's parents and grandparents were driven out by government in the 1950s; their ancestral lands were sold as plantations to farmers. The Kaiowa shifted around the state for decades eking out a living with a bit of hunting and farming, until in 1990 they decided to try to exercise their new constitutional right and filed a claim for the land. But they had no response for years, and finally in 2004, they decided to go and live there. That year, and in 2007 when they tried again to occupy the land, they were driven out after a couple of days by the farmers who held title. In a third attempt, in 2011, they set up a rough camp of a few houses – and then a group of armed men came to confront them, and Mr. Gomes's father, Nizio, was shot and killed. Mr. Gomes says the killers were sent by local landowners, including Mr. Chami's family, in an attempt to force them off the land. These two men, divided by a couple of kilometres and a lifetime's worth of conviction, are living out a daily confrontation that is both a historical legacy and an urgent modern problem for Brazil. Their competing claims to the land echo disputes in Canada and across the New World, between Indigenous communities and the governments of states that were built over top of them. Canada's own land claims issues are far from resolved, but there the usual battleground is the courts. In Brazil, these disputes still regularly erupt into bloodshed. 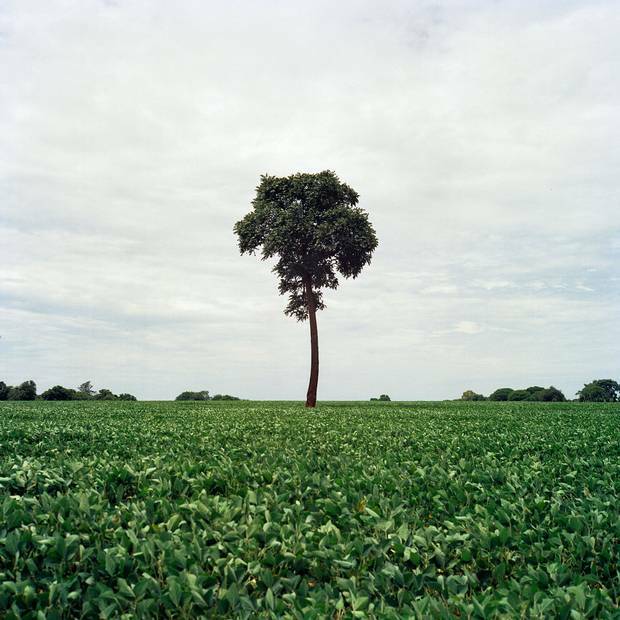 A soy field next to the village of Jiguarapiru in Mato Grosso do Sul. Disputes between Indigenous people and landowners in this western breadbasket state still regularly erupt into violent conflict. In Brazil, Indigenous people are taking their own lives at a rate 22 times that of their fellow citizens. Stephanie Nolen and photographer Aaron Vincent Elkaim went to Guarani-Kaiowa territory to find out why. There are 900,000 Indigenous people in Brazil, and 12.2 per cent of the country has been declared Indigenous territory, collectively owned by First Nations. Some 98.2 per cent of that land is in the Amazon, and there is conflict around parts of it: Illegal loggers invade it, cattle ranchers try to claim it, and some areas have been irrevocably altered by large government infrastructure projects such as the Belo Monte Dam. But the worst of the conflict is here, in Mato Grosso do Sul. 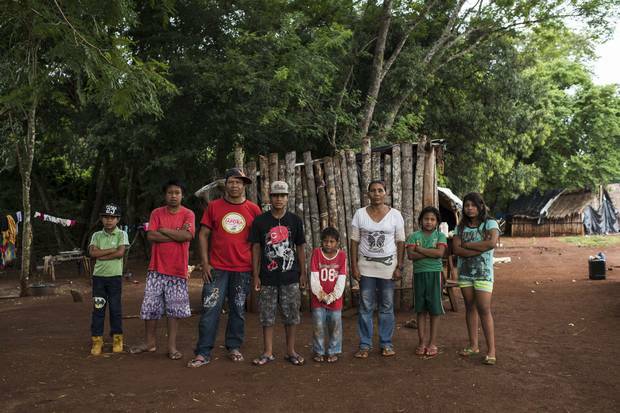 Slightly more than half of the 754 murders of Indigenous people between 2003 and 2014 were in this one state, according to a report on land conflict compiled by the Indigenous Missionary Council, a Catholic organization that is one of the few advocates for Indigenous rights in Brazil. Ownership of more than two million hectares in the state is being disputed between Indigenous people and other claimants, mostly farmers. Brazil's military dictatorship ended in 1985, and the new democratic constitution, which recognized the rights of Indigenous people to their land, charged the National Indian Foundation (FUNAI), an arms'-length government body, with demarcating what would be Indigenous territory. But that process has never been popular with loggers or farmers. Agriculture is one of the few healthy sectors in Brazil's hobbled economy, and the farm lobby is a key backer of President Michel Temer, the former vice president who took power after Dilma Rousseff was impeached last August. Under his tenure, the already slow process of adjudicating land claims has stalled completely, and the disputes are growing increasingly violent. In the last hours before she was impeached, Ms. Rousseff's government approved a long-delayed plan to expand the Guarani-Kaiowa territory, from 3,600 hectares to 56,000. Agribusiness responded with outrage, and newly installed President Temer froze action on the report. In January, the government issued a decree that ended FUNAI's independence in deciding land claims and gave the Ministry of Justice final approval, saying the move would accelerate stalled cases such as that of the Gomes family. The farm lobby heralded the change; Indigenous activists say it is an outright violation of the constitution. Mr. Temer's administration has taken a position on Indigenous issues that is conservative even by Brazilian standards. Last month, Osmar Serraglio, the new justice minister, said that Indigenous people need to "stop this discussion about lands" and that their problems could be fixed with better economic opportunities. "Land doesn't fill anyone's belly," he said. He spoke approvingly of court decisions that have favoured agribusiness over Indigenous land claims and said the Indigenous movement was being pushed by non-governmental organizations; he suggested they might somehow be profiting from the land claims issue, although he did not explain how that would be. A third of the donations to his last campaign for office came from agribusiness. President Temer also appointed a new head of FUNAI; while the organization has traditionally been headed by anthropologists and experts on Indigenous issues, Mr. Temer chose an evangelical pastor and dentist named Antonio Costa. In his first major interview, this past week, he said that Indigenous people can't remain "frozen in time" and will have to figure out ways to join the formal economy. "American Indians are productive – they have casinos," he said, heaping praise on that economic model. 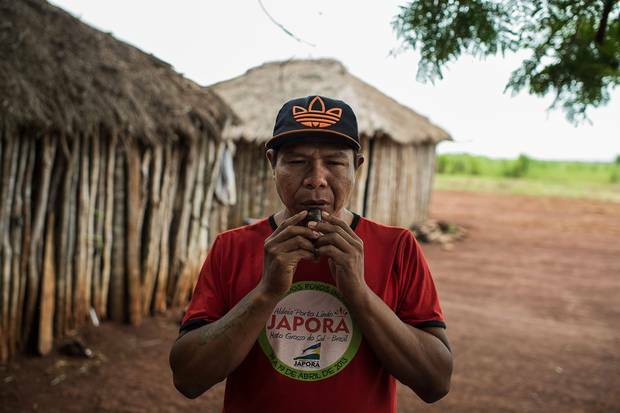 The conflict in Mato Grosso do Sul has intensified over the past year; a series of farm occupations by Indigenous groups have been violently broken up by what the state prosecutor calls "militias" formed by farmers. At least two Indigenous men were shot and killed by militia members, and a half-dozen more were wounded. Three police officers were abducted and beaten by a group of Guarani carrying out an occupation, and farmers report that their livestock have been killed and possessions destroyed. After armed men killed his father, Genito Gomes used this whistle to call the family out of the forest when the men had left the area. Listen to him play the whistle here. Back in 1990, Mr. Gomes's father, Nizio, made a land claim on behalf of his people for 30,000 hectares. For more than a decade, there was no official response. "They told us, 'Wait, wait,'" says his son. "Finally, in 2004, we said, 'Enough.' " Their third attempt to retake the land, in 2011, might have ended with their expulsion much as the others had. But on the 18th day, he says, a line of eight vehicles carrying armed men with masks over their faces, dressed in black or camouflage, pulled into the camp early one morning. Everyone around the houses and the cooking fires fled into the trees. The armed men went into the forest and called the elder Mr. Gomes, 62, to come out from where he was cutting brush with a machete. A dozen members of the extended family saw him shot, according to testimony collected by the state prosecutor, and then the attackers dragged him out – leaving a wide streak of blood on the ground – and loaded him into the back of a truck. His body has never been recovered. Twelve men were charged with crimes related to the killing; seven are in jail and five are out on bail, all still awaiting trial. (Mr. Chami's father-in-law, Idelfino Maganha, is among those charged.) The accused say that Mr. Gomes was not shot – that he disappeared, fled across the border to Paraguay, and is alive and well. The case might never have gotten as far as it has had the wife of one of the accused not gone to police to report his involvement when she found out he was having an affair. Prosecutors were prepared to act on the testimony of one bitter wife, but not dozens of Indigenous eye witnesses to the attack, notes Genito Gomes. Before the shooting, the Maganha family had obtained an expulsion order – but FUNAI had it overturned after the shooting, and the Supreme Court ruled that the Gomes family could stay until their land claim is adjudicated. The farmers believed that by killing Nizio Gomes, the cassique, or chief, they could drive the occupiers off, the younger Mr. Gomes says. They have faced a constant threat of violence through the ensuing years – armed men with dogs on chains continue to patrol the periphery of the area they occupy. "But we stayed because this is our land – it belongs to the Kaiowa – we lost our leader, lost our father, but we'll stay." Mr. Gomes says his father remembered being carried off this land as a child of 3, in the arms of his own parents, when the Guarani-Kaiowa were forcibly dispersed by the federal government in the 1950s so the land could be made into maté plantations. (Before they were moved out, they were forced to chop down their forests and clear the land for the new occupants.) Some of the family went to Paraguay, some to towns or reserves in Brazil. "But our parents always said, this is your land." Today his family business is spending the equivalent of $17,000 per month on private security to protect the land, he said; a group of Guarani invaded the farm workers' quarters and drove out the occupants and occupied those, too, back in 2011. He said they have received no compensation from the government for the land they have lost – a fifth of their farm. What frustrates him most of all is that the occupied land is not, from his perspective, in use. "They take our land and it's not productive: What's the point of their land – they produce nothing. Not even cassava to eat – the government has to give them everything. They're just producing children – now there are 200. Soon there will be 300, and then 400 – where's it going to end?" Tamil Flores, 9, left, and her brother Hudson Flores, 6, play in a stream in Guaiviry. The Maganha farm has never employed Indigenous workers – Mr. Chami says they "have no interest" in working. This view is widely shared in the agricultural industry in the state. Indigenous people live on reserves surrounded by farms that in most cases refuse to hire them; the stereotype of "lazy Indian" is so entrenched here that the words are often spoken as one. Consequently there is near-total Indigenous unemployment. Mr. Chami says the family fears they may lose more land, if the demarcations go forward after court challenges. "Because of the politics it might be possible – but we're working to keep that from happening." How? "With registered arms and private security." But he does not expect help from government. "It's frustrating, to be honest – because our production is what lifts the country." Agriculture contributed 23 per cent of Brazil's GDP last year, one of the few healthy sectors as the country drags through a brutal recession. Mr. Gomes says that, in fact, his family is making intense use of the land: They must be on it to perform the rituals that keep them healthy and whole. They gather to dance in the early morning and the evenings. They hunt and they fish. Their life there is basic: their camp has no electricity, and they bathe in and bring drinking water from a river. But they prefer this to anywhere else. "We need the land to be able to live our culture," he said. "We Kaiowa, we know the danger from the farmers. But we have to come back to our land. It's sacred. That's why it's worth it to us to risk, so we can be on the land." Some people in the tribe get a family-allowance grant (as do nearly half of all Brazilians), and some get a rations basket from FUNAI. But there is no work. "There's only jobs on the farms and nobody wants to work for the enemy." Carlos Marés, a former head of FUNAI and a professor of agrarian law, has spent his career assessing disputes like these, and says there is some validity in both perspectives. "The lands are Indigenous, at least part of them, according to the constitution of 1988," he says. "But the occupants, most of the time, bought the land in good faith, without knowing the extent of the conflict." Brazilian law permits the government to buy farm land and give it to the Guarani-Kaiowa to settle land claims, he said – but only when farmers agree to sell, and the federal government sees its interests most closely aligned with agribusiness. That means the conflict will likely intensify, he said: "Indigenous people, not just the Guarani, but all over Brazil, lack land and are determined to fight to the death for it, so there can be no solution to the conflict without restitution of the land to them." That's how Mr. Chami sees it, too: "They want their own country," he said, tossing up his hands in frustration. Mr. Gomes, across the road, puts it more simply. "We just need to be home, on our land." Brazil: Exploring a nation's colour bind Brazil is combating many kinds of inequality. But one of the world’s most diverse nations is still just beginning to talk about race. A Globe multimedia investigation. From El Salvador’s violence to a tenuous toehold in Trump’s America In 2015, Stephanie Nolen chronicled 14-year-old Fernando's attempts to flee the violence of El Salvador for a new life in the U.S. Reconnecting with him in Florida, where he waits to make his case for asylum, she finds a young man whose future has been thrown into question once again. Mexico: How an exodus from the U.S. began long before Trump For years now, more migrants have been leaving the U.S. for Mexico than the other way around – to seek economic opportunity, flee discrimination and many more reasons, personal and political.